FRIDAY’S FANTASTIC FIND is FALLEN FOR YOU by CARLIE SEXTON. And so it is with Kate Simmons, a young woman who, by choosing to regain her life, actually puts it at risk by the very choices she makes. After unimaginable heartbreak stops her world on a dime, Kate falls into a three-year blackness of self blame that brings her to the edge of life, itself. As time finally brings light back through tiny cracks of renewed desire,Kate moves out of the prison she made for herself in her mother’s home to find a new reality, rooming with her best girlfriend, Charlie. I really had a hard time deciding whether or not to give Fallen For You four stars or five… but I was so speechless when I finished reading Fallen For You, I realized I had to give it all five stars. With that said the only reason there was ever a question in my mind about how many stars it deserved was because of the ending of this book. Without giving anything away, it was NOT a bad ending at all, just left me wanting so much more! 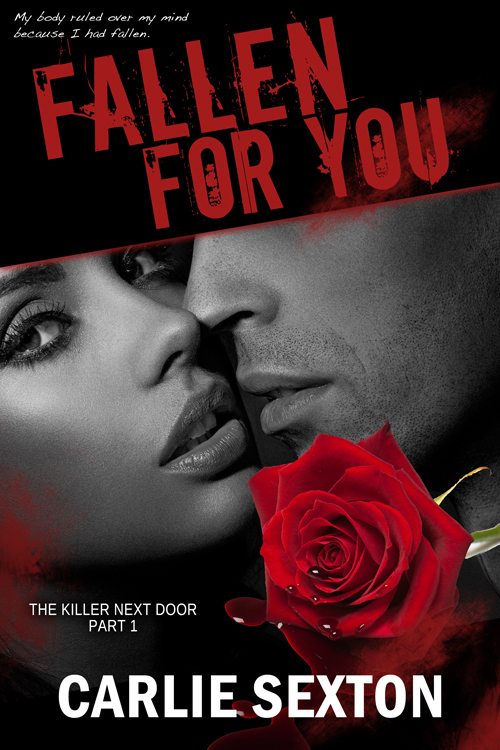 New indie author Carlie Sexton shows her skills in her debut novel Fallen For You the first book in her The Killer Next Door series. I love a good spicy romance with a little suspense but let me tell you Ms. Sexton puts that and more in to this book. When I picked up this book to start reading it I thought I knew where it was going go and was WRONG! This was definitely a book that had a chilling stalker, murder, suspense and romance all rolled into one really great story. I was give this book as an ARC by Carlie. If you are a fan of the show Dexter you are going to love this book. I have a huge list of books that I love in the murder mystery folder, and this one is going to top of the list. This book keeps you wondering if there will ever be a happy ever after but more than that it makes you think about everything that has happened in the book and if Kate will make the right choice. I can’t wait for more of this series and from Carlie Sexton!!! I was given this book as an ARC by Carlie. And if you are a fan of the show Dexter you are going to love this book. I have a huge list of book that I love in the murder mystery folder, and this one is going to top of the list. This book keeps you wondering if there will ever be a happy ever after but more than that it makes you think about everything that has happened in the book and if Kate will make the right choice. I can’t wait for more of this series and from Carlie Sexton!!! Carlie Sexton has had a passion for reading her entire life. She loves it so that she dedicated her life to educating children. As a teacher, she has had the profound pleasure of teaching children to read and explore their imaginations through a good book. Just recently she decided to write a story that had been on her mind, Fallen for You (The Killer Next Door, Part 1). The sequel Taken by You will be released on 7/9/13 and the final book in the series, Given to You in August. Now she has several that she wants to turn into additional books. Writing has become a passion that she dearly loves.